I hope this is allright. I made the chibis a little bit less brighter and I fixed up the windows. Also I added more stars. Hehe,so cute!! !XD And the bg is nice too!! !^^ Hehe,Eiji!!!! !^_^' +fav! Thanks for sharin cool chibi wall ^^. Uwahh~ thanks for entering! XD (so quickly, too~<3) Hehe. :) I'll add your name to the page asap. :D two cute boys..........^^the wallpaper is nice.thanx for sharing it. Hey this is really cute! The chibi characters from POT look really good, You did an excellent job on this one! Keep it up! I like it very much. They are just cute. Awww............Nice wallpaper, they're so cute! XD XD Somene had finally submit another wallpaper on POT :D :D , thanks so much for sharing! YOu're really good in making wallpapers, maybe you should really join the Tenipuri wallpaper contest! The chibis look kinda... evil ^_^' But evil in a cute way, mind you, so that's good! I do like the background too. Great job on that! 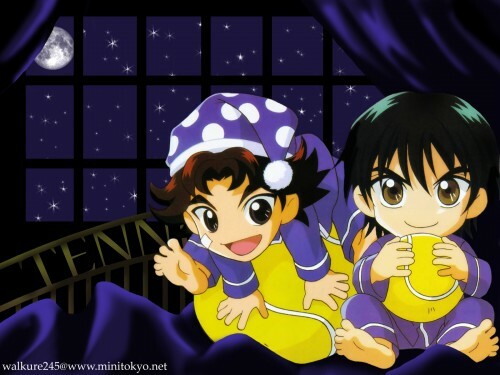 Eiji n Ryoma (i think Kaido^^) is soo cute!! i dont know the serires....but they look adorable! and i love the bg! you did a great job on it.... and who said i was sick of your wallies? NO SUCH nonsense! XD see ya soon! and take your time answering comments! no rush!